When it comes to cleaning restrooms and other heavily soiled areas, nothing beats Spray-and-Vac cleaning technology. And the OmniFlex approach offers a cost-effective and easy way to get there. 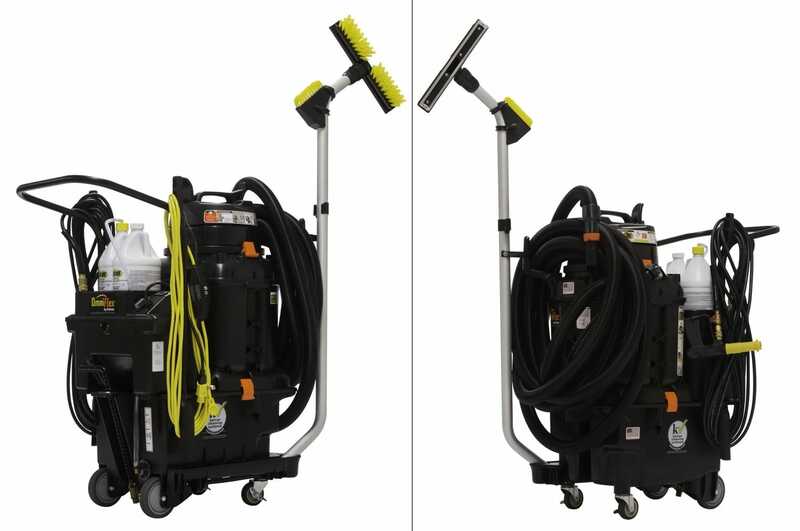 Just purchase a preconfigured 500 psi Spray-and-Vac system, or combine the 500 psi OmniFlex Pump System with the Wet Vacuum and the Trolley-Bucket for the ultimate cleaning experience. Modeled after the original Spray-and-Vac system, Kaivac’s No-Touch Cleaning® machine, the OmniFlex system is built for extreme soil removal. It empowers workers to clean hygienically without touching contaminated surfaces. Plus, it helps cut labor, chemical and equipment costs. No area of the building generates more complaints than the restroom. The Spray-and-Vac thoroughly removes soils and other contaminants that mops and wipes leave behind, eliminating odors and reducing the risk of contamination. Spray-and-Vac systems get the grease out of grout lines and from behind equipment. They're also great for coolers, freezers, walls and more, resulting in clean, safe and healthy kitchens. Stair treads, handrails, ceilings, walls, and corners are a haven for soils and contaminants. The Spray-and-Vac system quickly deep cleans this highly traveled source of cross-contamination. Locker rooms, gyms, equipment and mats are not only a cleaning challenge, they're also high risk. Spray-and-Vac cleaning removes soils and odors while reducing the risk of disease transfer. Simply attach Kaivac's stainless steel carpet extraction wand to transform a Spray-and-Vac system into a CRI (Carpet and Rug Institute) Silver-rated carpet extractor. It includes dual spray nozzles for deep industrial carpet cleaning and water removal. The Spray-and-Vac enables rapid, complete removal of spill contents to keep employees, customers and surfaces safe. Plus floors are clean and dry for immediate use. The Spray-and-Vac system is perfect for weather-related cleaning like salt, water and mud pickup for improved floor safety and perfect first impressions. Parking lots, sidewalks and drive-thrus are a challenge to clean and can be subject to environmental regulations and fines. The Kaivac vacuum collects all water and soils for safe, environmentally-friendly disposal. Studies show that Spray-and-Vac systems are up to 60 times more efficient in removing bacteria from grout lines than mopping, which is more likely to spread contamination. Plus, cleaning solution always stays fresh because soiled water is vacuumed into a separate tank. A trained operator takes as little as one minute per fixture to clean a restroom compared to an industry average of three minutes per fixture. Automatic chemical metering improves chemical efficiency, reduces waste and insulates the worker from unnecessary chemical exposure. In fact, many users achieve outstanding results with plain water. Originally designed for restrooms, these systems are now used throughout the building, like in kitchens, stairwells, locker rooms and more. They also accommodate a variety of quick-connecting accessories, for wet or dry cleaning on hard and carpeted surfaces anywhere in the building. Unsurpassed productivity, multipurpose capabilities and massive chemical savings mean a very rapid return on your equipment investment. OmniFlex systems break down for easy cleaning access. Plus, they can go up or down stairs or across town in a small vehicle. The removable 'Black Box' Pump compartment and Wet/Dry Vacuum head can be removed for easy shipping or exchange via inexpensive carriers, such as parcel post. Unlike mopping that has no built-in process controls to enforce and ensure best practices, Kaivac's process is foolproof, resulting in consistent, repeatable results. allows efficient cleaning of large areas. reduces fatigue during cleaning. Includes a strap and clip for convenient hanging. for applying chemicals and pressure rinsing with fresh water. lets you vacuum, brush and clean grout with a single tool. High performance Squeegee Blades are engineered for maximum soil removal and extra-long life. facilitate storage of spray and electrical lines. provides a convenient location to store the Vacuum Wand while collecting excess liquid. attach to the Vacuum Tank for wrapping hoses and cords as well as hanging tools, wet floor signs, bins, bags and more. Collecting and disposing of trash is a nearly universal facility problem. And the larger the facility, the bigger the job. For example, schools, stadiums and airports may have dozens, if not hundreds, of trash cans to empty every single day. That’s a lot of labor and trash volume. What’s more, trips to the dumpster add up to a lot of lost productivity. What if you could reduce your trash volume by a third, or even a half? Kaivac's vacuum-powered Trash Compactor removes the air from trash bags in seconds, instantly shrinking them down. The technology works similarly to a food vacuum sealer. To operate, simply place the wand in the trash bag, crimp the top of the bag around the wand by hand, turn the vacuum on, remove the wand when it’s deflated and store the bag in the optional can or seal with a twist-tie. A reduction in trash volume means workers can collect more at a time, stay on task and be more productive. The reduction also translates to the trash cart as well as the dumpster, which will need less frequent emptying. Battery Capacity N/A N/A 20 A-hr. N/A N/A 20 A-hr. Cleaning Width 14" (35,6cm) 28" (71,1cm) 28" (71,1cm) 14" (35,6cm) 14" (35,6cm) 14" (35,6cm) with Vacuum Wand. 28" (71,1cm) with rear-mounted AutoVac attachment.